I know what you’re thinking… This chick is giving me some tips on how to get my kid to listen, but now what? It is important to work on listening skills BEFORE you need your child to actually listen… What do I mean by that? If you expect your child to STOP because he is running toward a busy street but you’ve never actually taught him to STOP… Chances are, he probably won’t stop. However, if you teach him to stop in his natural environment during play time, your child will probably have a higher chance of stopping in a time of crisis. Teaching a child a new skill in their natural environment is a fantastic way to support all of these suggestions to ensure that your babe knows HOW to listen as well… I call this natural environment teaching! When you are doing natural environment teaching, you can show your babe a new skill and they don’t even realize they are learning because it is done through play…. Win-Win! Here are some great activities to teach them to ‘listen’ and they won’t even know that you are explicitly teaching them! 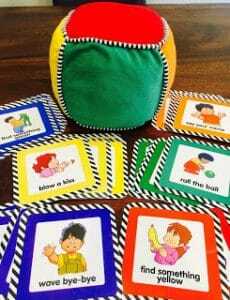 Touch & Feel Picture Cards– These are picture cards which is a great way to increase listening skills because you can lay out cards and ask your kids to either point to specific cards or hand them to you (i.e. hand me the bear, point to the key, etc). Another great feature about these cards are the guiding questions on the back which can be modified for various age groups. I bought them for my 1 yo but I can also ask my 4 yo questions for her to respond to as well! It doesn’t hurt that these cards are just as reinforcing with the addition of the tactile experience. I LOVE these sets! 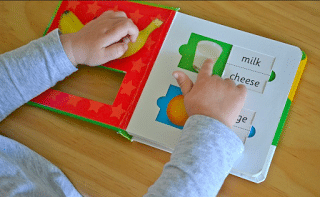 They have first words, animals, shapes… All sorts of options! Play ‘Stop & Go!”– I play this all the time with my little ones and it is a great game to start teaching the important skill of learning to STOP when needed! We will just be walking along and all of a sudden, I will say, “STOP!” and my littles will stop in their tracks until I say “GO!” They love it! You could also incorporate music and do the same thing. The important part of this game is that your child learn STOP means! And trust me when I say, when your child responds to the demand of ‘stop’, it is extremely valuable! This is a really important game to play in a natural setting so you can have this tool in your toolbox when you need it! Below is a picture of my 1yo at a train station. 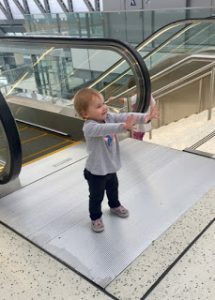 She was about to go down the escalator by herself but thankfully, I told her to ‘STOP!’ and she immediately put her hands up and stopped like she does when we play the ‘Stop & Go‘ game! Thankfully we play this game so often in a natural setting that she knew what this demand meant and she stopped right away! Whew… Crisis averted (← Insert superhero voice here)! Play Red Rover, Red Rover This fun game will be a natural way to teach your child to respond to their name when it is called. Who wouldn’t appreciate that? This also promotes turn taking and waiting to take turns!!! We all know that our tiny humans can all work on this skill, lol 😜. Play Simon Says! This is a FANTASTIC way to increase listening skills in a fun way while implementing the tips that we talked about in previous posts. If you have a child who is not responding to the directions, work on following through on the first direction! However, your child will be listening for directions but in the context in a game so chances are, they will follow through right away! Reinforce your child when they listen… This is a great way to establish the contingency that they will get a TON of praise when they use those listening skills. This will then carry over to the ‘real world’ when they listen to you during times when you REALLY want them to… Like when you ask them to get their shoes on or to brush their teeth! Dance to “Cha Cha Slide” by DJ Casper I did this a lot with my students… And who doesn’t love a good dance party? “Cha Cha Slide” has a TON of directions that kids will have to follow in their song and honestly, it is just a really fun song to dance to. This song helps to promote gross motor development in the dance moves they have to complete but also cognitive development because they have to listen to the directions (i.e. two hops this time… slide to the left, etc). And did I already mention that a dance party is fun for everyone?!? Point to Pictures in Book When you read to your child, ask them to point to different pictures/items on the pages of the book. This will further increase their listening skills and it is a fun way to expand your read aloud! Discovery Cube Game I have this super old game that I somehow inherited that is a colored cube. 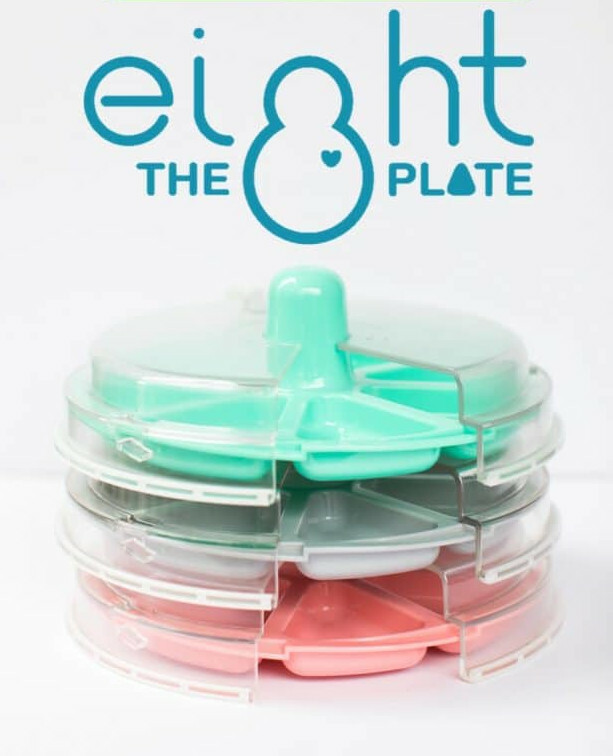 Each color has a set of cards that has simple demands on it. My girls LOVE this game but is a great tool for increasing ‘following directions’ and can be easily replicated! These ‘follow directions’ are anything from ‘hop up and down’ to ‘blow bubbles’ to ‘give a high five’ to ‘go to sleep’. You could put your own creative minds to work and create your own if want! Whether you consider yourself an ‘Amazon Prime’ mom or a ‘Pinterest Mom’, I would love to see some of your own renditions or ideas on how you intend to try to increase listening skills with your babes… Share your ideas below!